With all the extra entertaining during the holidays, it is possible that you might actually have friends or relatives visit you who previously have shown no interest in gardening. Whatever will you talk about if you don’t talk about gardening? After all, as the host or hostess, it would be rude to not say anything to these non-gardening guests. And you can’t just start babbling on about gardening until their eyes glaze over. Well, you could talk about gardening until their eyes glaze over, but too soon they will be furtively looking for their coats and sending out that pre-arranged signal that is intended to be picked up by whoever they came with, the signal that means "save me from the gardener" or "let's go NOW". Instead, you can talk to them about books, specifically, the five books you’ve left on your coffee table because they might spark an interest in gardening in the non-gardener. You’ve strategically and purposefully left these books out in hopes that they might lead to a conversation about gardening that won’t cause the non-gardener to roll their eyes and act like they just saw a long lost friend on the other side of the room, please-excuse-me-I-need-to-go-say-hi. Hopefully these books will lead to a conversation that soon has the non-gardener ordering up some seeds and a hoe, and asking you what to do first in their garden. What are these magical books that could turn non-gardeners into gardeners? In no particular order, I present “five books to leave on your coffee table because they might spark an interest in gardening in the non-gardener”. Bulb by Anna Pavord . Someone will see this book and the pretty tulip on the cover and think it is a book about just tulips. Then when they open it up and see the hundreds of flowers that are planted in the garden as bulbs, they will fall in love with the idea of planting bulbs in their garden… or something like that. Flowers and Herbs of Early America by Lawrence D. Griffith . Is there a non-gardening history buff at the party? They’ll see this book as a history book first, but will be amazed by the pictures and soon will be reading about all these plants. “Who knew”, they will think, and then they will start planning out their own garden using some of these very same plants. How to Grow Vegetables and Fruits by the Organic Method, edited by J. I. Rodale and staff. When your non-gardening party guests pick this book up you can tell them that it is just like the book you used to check out of the library over and over again when you were a kid and you found it at a used book store for $8 and had to have it. They will then think that perhaps they really should take a second look, or a first look, at planting a vegetable garden. Edible Landscaping by Rosalind Creasy. Your non-gardening party guests will see this book and look again at the appetizers and other food you are serving and wonder if they are perhaps eating something you clipped off the shrubbery out front. You can assure them they aren't, unless you really did do that. Then you can go through this book with them to show them how beautiful fruits and vegetables can be when you grow them in the landscape. Two Gardeners: A Friendship in Letters by Katharine S. White and Elizabeth Lawrence. Once the seed of interest in gardening has been sown in the non-gardeners at your party (do you like that phrase?) you can talk about the many facets of this book. To some it can be read as an interesting exchange between two women who only met a few times in real life, and then not until well after they had corresponded for many years. Interesting comparisons can be drawn to how garden bloggers often correspond online through emails, blog posts, comments, etc. and then later meet. Or, you can use it as a way to introduce the budding gardener to the writings of these two garden writers and suggest other classic garden books for them to read. And that’s “five books to leave on your coffee table because they might spark an interest in gardening in the non-gardener”. Thank you to Genevieve at North Coast Gardening for suggesting this meme, Five Books: Essential Reads for Gardeners! My mom gave me her copy of the Rodale and Co book. As an Air Force wife she didn't have a plot of ground of her own until after I was grown and gone away. Thus I don't have any memories of her as a gardener. But when I read that book, it's filled with her column notes and I find that I get my love for gardening genetically after all. Good idea! 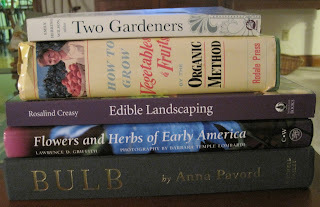 I've only seen the Edible Gardening book (it's beautiful and sure to spark conversation). Now I know what to ask for as a Christmas gift - any of the other 4 books! I have got to read "Bulb." I must the only gardener who hasn't read it yet. Maybe I should put it on my Christmas list. I'm with Mr McGregor's Daughter - We've got to be the only two people left in the world who haven't yet got a copy of Bulb. I have another by Pavord and adore it; clearly it's time to put this on my Christmas wishlist! My coffee table is always full of books, the newspaper, magazines, and a forgotten tea cup. And the books often inspires conversation, just as you have suggested. Once an elderly woman knocked at my door because her husband was working at a house down the road and she needed to call a doctor. I quickly sat her down, with the obligatory comment that she should ignore the mess on the coffee table. She shook her head and said it just looked like I was a woman with many interests. She should be in the diplomatic corps. She used the phone and I took her to the doctor and all was well.